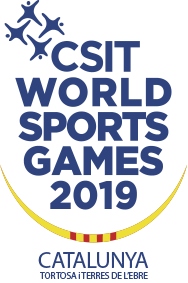 Athletes who participated during the last 4 years in Olympic Games, IAAF World Championships or any Continental Championships (European, African, Asian, Oceanian, Pan American Games) are not allowed to compete in CSIT World Sports Games or CSIT Championships. These championships are open for men and women from 16 years and older. Each union may register per team a maximum of 3 athletes per event. If a union wants to register a team, it must be composed from minimum of 5 athletes. Unions can participate with more than 1 team. A team is composed from maximum of 39 persons. Each additional team has a maximum of 38 persons. There is just 1 (one) head of the delegation. 4 x 100 m and 4 x 400 m.
Women: 100 m, 200 m, 400 m, 800 m, 1.500 m, 400 m hurdles, high jump, long jump, shot put, discus throw, relay 4 x 100 m.
Men: 100 m, 200 m, 400 m, 800 m, 1.500 m, 5.000 m, 400 m hurdles, high jump, long jump, shot put, discus throw, relay 4 x 100 m.
Men: 3.000 m steeple chase, 5.000 m, 10.000 m and 5 km walking.